Have a smaller venue were Monster Trucks are too big for a show? Smaller budget? Have a concrete or asphalt arena? Need an exciting up and coming sport? 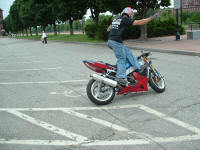 How about modified street motorcycles designed to do a variety of different tricks? At a Stunt Bike show, what the Freestyle motorcycle guys are doing in the air, these guys are doing on the ground. At a Stunt Bike performance, professional riders who have won National tournaments across the country on 600cc to 1100cc street bikes will battle it out to be the best in show. 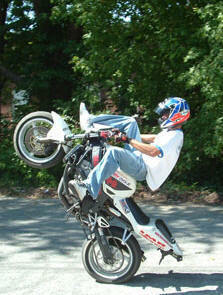 Anything from riding backwards, handle bar seated wheelies, Flamingos, to burning the rear tire right off the rim. 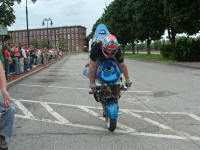 These expert stunt bike performers will stop at nothing to give you the best stunts in their bag of tricks to be called number one. 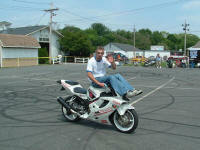 The audience is encouraged to cheer for their favorite rider or most outrageous trick at these Stunt Bike shows. Virtually no track maintenance is required. Sweeping or blowing off any dirt or debris in between Stunt Bike exhibitions, or if you have a finished concrete surface, coke syrup would need to be applied to make the surface tacky for the bikes. 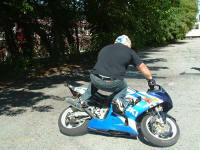 Removal of any fluids leaked on the track surface would need to be removed also. 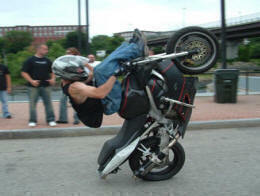 If a Stunt Bike exhibition is what you’re looking for, East Coast Extreme can provide the best riders in the country. They are professional and more than happy to sign autographs for the fans. Show lengths vary depending on what your needs are. This can be a stand-alone show or a filler act run in conjunction with another event you may have going on at the same time.